LogicAll Solutions (LAS) announces its new membership to the Western Dredging Association (WEDA) headquartered in Vancouver, WA under the Direction of Lawrence M. Patella. The WEDA encompasses North, Central and South America, and is one of the three organizations that form the World Dredging Association known as the WODA. As providers of surface mining monitoring solutions for the past decade, LogicAll Solutions’ expansive “Global Ready” family of TerraRover products includes dredging solutions. About LogicAll Solutions – Based in Bradenton Florida, LAS provides a family of products and systems which leverage GPS technology and are primarily utilized by the mining industry. These TerraRover monitoring products are designed to improve vehicle efficiency to include safety monitoring, geo-fencing, data logging, production reports and other permitting compliance data. They are ideal for use on dragline cranes, barges, booms, dredges, drill rigs and other industrial oriented offroad heavy equipment. Safety can be as much of a concern as productivity. We have created a new variant of the LAS Boom Monitor which provides the ability to display the position of GPS capable vehicles which operate near the crane. This helps crane operators to be aware that vehicles are near their boom. This will help prevent accidents either related to the boom or the crane's bucket. Be safe - be aware. Click here to view example screen shots. LogicAll Solutions has been in discussions regarding utilizing the LAS Boom Monitor on construction cranes. Knowing where a crane's boom is in relation to the city streets could prevent or minimize the damage caused by a crane collapse. The LAS TerraRover TrailBlazer applications are now available for download! The North American and European versions can be downloaded here and the Global versions are available if your site is outside of these two areas. The North American version is effective in the States as well as southern Canada and northern Mexico. The version for Europe is effective in the following areas: Austria, Belgium, Denmark, Finland, France, Germany, Greece, Italy, Luxembourg, Netherlands, Norway, Portugal, Spain, Sweden, Switzerland and United Kingdom. In addition the following areas support our zoom levels: Andorra, Bulgaria, Croatia, Czech Republic, Estonia, Guernsey, Hungary, Ireland, Isle of Man, Jersey, Latvia, Liechtenstein, Lithuania, Monaco, Poland, Romania, San Marino, Slovakia, Slovenia and Vatican City. Download the software today or place an order with us if you have multiple systems. Full systems (GPS with rugged PC) are available on demand. We are pleased to announce that the professional version of the LAS TerraRover TrailBlazer software has gone gold. The professional version adds the ability to display production lines on the screen for the vehicle's operator to use as well as logging position data for later use. More good news: the European version of the LAS TerraRover TrailBlazer just passed acceptance testing for tracking while the vehicle crosses the Prime Meridian. View images of operations in France (east & west of PM) by clicking the links. What is your UTM zone? We use the UTM - Universal Transverse Mercator - zones to make our distance calculations as accurate as possible. If distance is important to your vehicle operators, you'll want to enter the correct UTM value into our software. Take a look here for an image depicting the UTM zones for North America. We'll have a global map of the UTM zones available soon. Great news for our friends in Europe! The LAS TerraRover TrailBlazer for Europe has been elevated to beta status.  Click here to view screen shots of a test pattern as run with coordinates set for North America and the other one offset for Europe. This version of the LAS TerraRover TrailBlazer uses Microsoft's mapping engine for Europe which is effective for the following areas: Austria, Belgium, Denmark, Finland, France, Germany, Greece, Italy, Luxembourg, Netherlands, Norway, Portugal, Spain, Sweden, Switzerland and United Kingdom. In addition the following areas support our zoom levels: Andorra, Bulgaria, Croatia, Czech Republic, Estonia, Guernsey, Hungary, Ireland, Isle of Man, Jersey, Latvia, Liechtenstein, Lithuania, Monaco, Poland, Romania, San Marino, Slovakia, Slovenia and Vatican City. Non-English language versions of our software can be made available on request with an order. For our friends outside of North America and Europe, the global version of our software is fully functional anywhere on the planet. 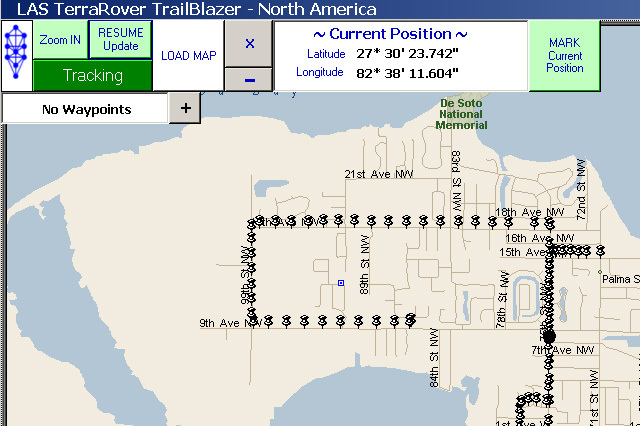 Get started collecting waypoints and planning routes for your site now with the global TrailBlazer and you will have coordinates ready to utilize with the higher level applications when they become available in the next few weeks. We have added a new option to the products list: Software Downloads. Take a look at the options currently available and what is in the works. For more information, click here. The LAS TerraRover TrailBlazer for North America has gone Gold! The North American version of the LAS TerraRover TrailBlazer will be available for download soon. Dust off your old copy of Microsoft MapPoint and load it - you'll need it. The LAS TerraRover software which has been developed for use in North America utilizes the MapPoint engine to provide a highly detailed visual interface for your vehicle operators. Note: we have verified that the North American version not only works well across the United States - it also works with Canadian coordinates! The LAS TerraRover TrailBlazer for North America is currently in beta testing. The North American and European versions of the LAS TerraRover TrailBlazer utilize the Microsoft MapPoint platform for position reporting. The global TrailBlazer application provides functionality for any location on the planet but "maps" are generated as the vehicles travel. Both variations of the software are exceptionally useful and typically where mining equipment is used there are no roads mapped - but the graphics are more attractive in the North American and European versions of the TrailBlazer. Note that the software download does not include Microsoft MapPoint but it works with version 2004 and higher, giving you some freedom to possibly see some savings by locating an older copy of MapPoint. The LAS TerraRover TrailBlazer is expected to be through beta testing soon and we'll let you know when it is available for download. If "it doesn't have to be pretty, it just has to work" is your motto, then download the global version of the TrailBlazer now and get started making your site more efficient! The LAS TerraRover TrailBlazer was released for download! Blaze your Trail anywhere on our beautiful blue planet. Take a look at the data sheet here for more information. The TrailBlazer is available for download with payment processing available for multiple languages. Beta testing is complete for the LAS TerraRover TrailBlazer! We are in the process of setting up distribution channels to make the application available to the global community. Our TrailBlazer suite is the perfect entry point for sites interested in leveraging GPS technology to increase productivity and efficiency. The suite may also be used by anyone in the private sector anywhere on the planet with a PC/laptop and GPS hardware. There is a new demonstration program available for download! We thought you might like to try the LAS Line Builder application to see how we handle assigning and changing waypoints. Waypoints may be added to a system while at the location by clicking the "Add New" button on the LAS TerraRover Trailblazer screen. This will record the GPS coordinates of your current position and also allow you to type in a description of the location. The other method waypoints may be edited is by using the LAS Line Builder to directly edit the waypoints either on the PC running our software or on another PC which has a USB flash drive containing the waypoint database. Click here for the demo of the LAS Line Builder. Our development team has a new demo in the works. When we discovered that our mapping engine did not support operations in the southern hemisphere, we began development on a new application we call the TerraRover Trailblazer. The Trailblazer will allow the user to select the hemisphere where they are operating their vehicles and the application will automatically adapt its plotting functions. As an example, in the North America your latitude increases the further north you travel, but in South America the latitude reading increases as you move south. We expect to release the demonstration application soon, so check back frequently. Click here for an image of the location selection screen. Click here for information on our systems which are in use now in North America. We are pleased to announce that the Dragline Monitor LT system is now available for use in North America. Providing all the functionality of the Dragline Monitor but without the additional cost of the hoist monitoring hardware, the Dragline Monitor LT provides an entry level approach to adding our systems to your dragline cranes. Click here for information on our Dragline Monitor systems. Take a look at our revised ROI statement. Use this document to assist in explaining to the decision makers how your site will benefit from adding our systems to your dragline cranes. Download the PDF here. What do you get with our systems? We have data sheets for all of our systems, but click here to see a document which provides an overview of why you get more bang for your buck. Sometimes big things come in small packages. Pit&Quarry magazine has an article in the Tech Watch section featuring our systems. Take a look and then browse through our product listings. Let us know which systems interest you the most. Habla Español? Sprechen Sie Deutsches? For our non-English speaking friends: We have translators available if you would like your TerraRover GPS Systems to display another language. 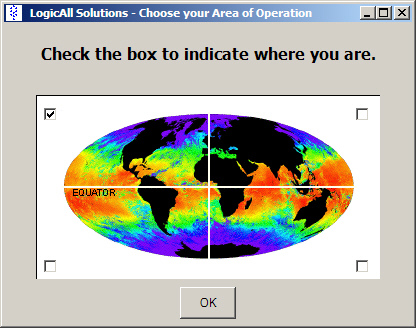 Our systems use the WGS84 coordinate system, so they work anywhere on the planet! Fill out our Contact form and in the comment section let us know what your preferred language is. A new form is available on the website! We have had hundreds of visitors recently from all over the globe. Please leave us a note by using the Contact form we just added. We can send you more information on systems or provide you with a quotation. Click here to view the form. We have done a few calculations to further illustrate the exceptional value and short term ROI our dragline systems will bring to your site. Pi are not round, they are squared... See for yourself the amazing results of volumetric calculations detailing the amount of material your site can avoid leaving behind by utilizing the functionality of the Dragline Monitor and Boom Monitor systems. Download the PDF here. A new PDF is available for the Dragline Monitor and Boom Monitor... Using production lines sounds like a good idea, but does it work in the real world? See for yourself! With satellite imagery available to the public, we took a look at some of the mining sites we've installed the Dragline Monitor system at. Wow! What a difference between the before and after pictures! It looks like the old pile would take twice as much work to gather and send to the crusher. Take a look! New versions of the Dredge Monitor, TerraRover, and Boom Monitor applications are now available for 800x600 resolution systems. 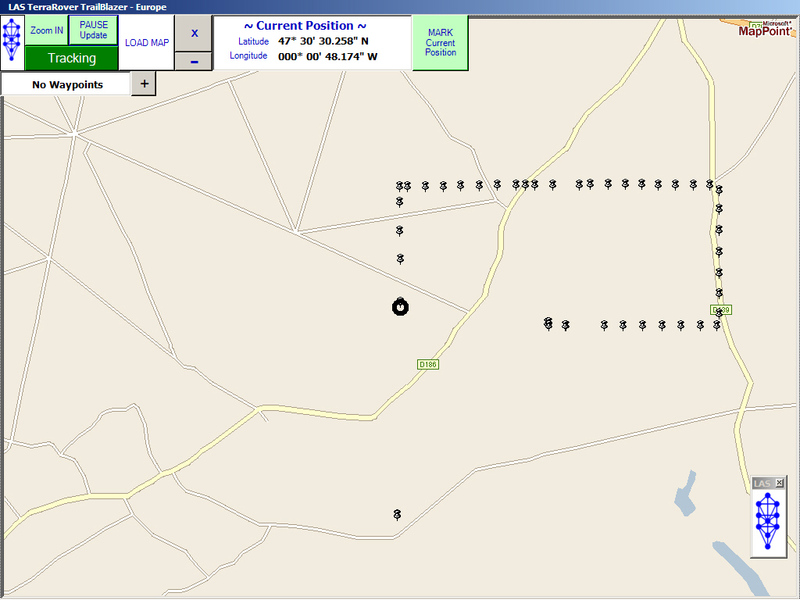 All of the LAS TerraRover GPS system's applications are formatted for 1024x768 resolution. One of the most common sizes of TuffRiders which DataMetrics produces has an 8.4" screen which is restricted to 800x600 resolution so we have made a special effort to make our applications available for users who prefer a smaller footprint for their rugged PC's. Call or email today to find out more. DataMetrics announces their launch into the market with our TerraRover GPS Systems. A solid partnership of hardware and software to make the most effective tools available for the aggregate market. www.datametrics.com. LogicAll Solutions becomes official reseller of the DataMetrics TuffRider Computers. Hands down the TuffRider is the best PC platform we've found to support the TerraRover GPS Systems. Ruggedized and sealed against the elements it's a perfect fit. LogicAll Solutions is now a member of the WEDA. - WEDA is the Western Dredging Association, composed of members from North, Central, and South America. The demonstration version for the LAS Boom Monitor GL will be available soon. Take a look now at your global location to determine which demo you'll want to download. We are currently developing the global version of the LAS Boom Monitor and it is coming along very well! Click here to see images. The demonstration version of the LAS Boom Monitor for North America is ready! Click here to download. The demonstration version of the LAS Boom Monitor for North America is ready! While the application is being packaged for you to download, take a look at a recent screenshot. We just installed a new version of the LAS Line Builder for one of our customers. With it, we included a how-to document for the user. Two demo downloads will be available soon for the LAS TerraRover Boom Monitor. For information about the LAS Boom Monitor™ systems, click here. We've made adjusting the boom settings even easier with our latest updates to the LAS Boom Monitor™ and LAS Dragline Monitor™ systems. Easy to install and simple to set up, the systems are the perfect tool to add to your cranes. Take a look. Safety can be as much of a concern as productivity. We have created a new variant of the LAS Boom Monitor to support the display of vehicles which may be operating near the crane's boom. Click here for an example. A press release announcing the availability of the LAS TerraRover TrailBlazer applications for North America, Europe, and abroad is available here. We have also updated our sales representative list to reflect recent changes. Click here. The LAS TerraRover TrailBlazer applications are now available for download! The North American and European versions can be downloaded here and the Global versions are available if your site is outside of these two areas. We are pleased to announce that the professional version of the LAS TerraRover TrailBlazer software has gone gold. More good news: the European version of the LAS TerraRover TrailBlazer just passed acceptance testing for tracking while the vehicle crosses the Prime Meridian. What is your UTM zone? With the North American and European versions of our software we use the UTM (Universal Transverse Mercator) zone to make our distance calculations as accurate as possible. If distance is important to your vehicle operators, you'll want to enter the correct UTM value into our software. 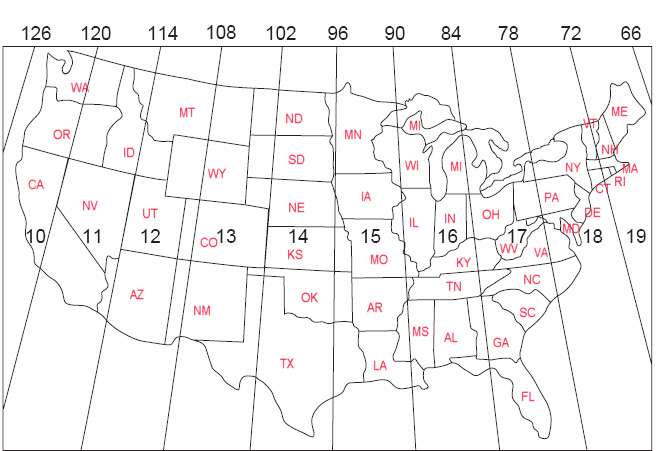 Take a look here for an image depicting the UTM zones for North America. We have great news for our friends in Europe! The LAS TerraRover TrailBlazer for Europe has made it to the beta testing stage. Take a look at a screen shot comparing one of our test patterns as it is displayed for North America and Europe. We have added a new option to the products list: Software Downloads. All of our software is being converted to downloadable packages for use by sites that already have the required hardware. Click here to see what is already available for your use. The North American version of the LAS TerraRover TrailBlazer has gone Gold and will be available for download soon! The North American version of the LAS TerraRover TrailBlazer is currently in beta testing and is expected to be available for download soon. The European version will follow. The LAS TerraRover TrailBlazer has been released for download! Blaze your Trail anywhere on our beautiful blue planet. Beta testing is complete for the LAS TerraRover TrailBlazer! We are in the process of setting up distribution channels to make the application suite available to the global community. The application suite will be ready for download in a few days. There is a new demonstration program available for download! We thought you might like to try the LAS Line Builder application to see how we handle assigning and changing waypoints. AsiaMiner - a magazine for the Asia-Pacific region has an introductory article featuring our TerraRover GPS systems. Take a look! Our development team has been working on a demo version of the LAS TerraRover Trailblazer application which will work anywhere on the planet. We are pleased to announce the addition of a new option to our family of TerraRover GPS systems. The Dragline Monitor LT is now available for use in North America. Our Dragline Monitor ROI statement has been revised to better illustrate the exceptional value and ROI our dragline systems will bring to your site. Click here. Pit & Quarry magazine has an article in the Tech Watch section featuring our TerraRover GPS systems. Take a look! Habla Español? Sprechen Sie Deutsches? We have translators available to make our systems useful anywhere on the globe. A new form is available on the website! Take a look by clicking here! We would like to hear from you. We have done a few calculations to further illustrate the exceptional value and short term ROI our dragline systems will bring to your site. Click here. A new PDF is available for the Dragline Monitor and Boom Monitor... Using production lines sounds like a good idea, but does it work in the real world? See for yourself! New versions of the Dredge Monitor, TerraRover, and the Boom Monitor applications are now available for 800x600 resolution systems. 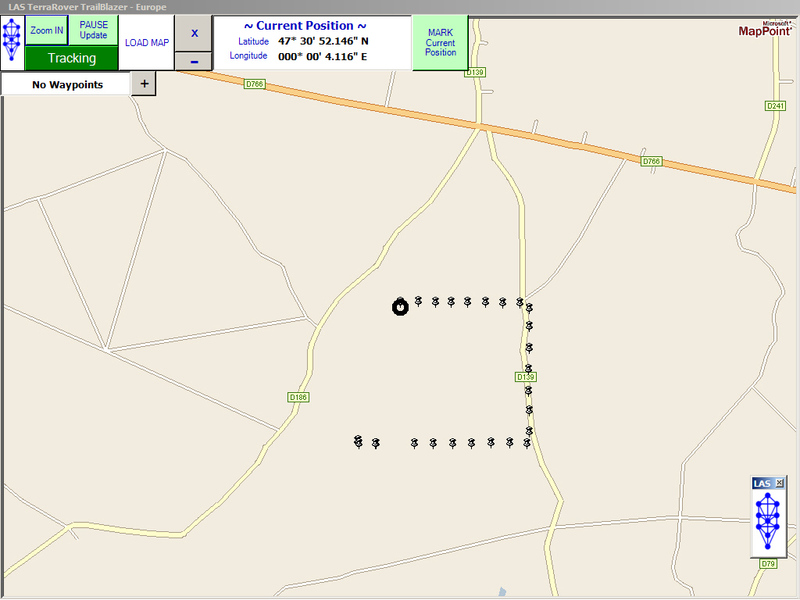 DataMetrics announces their launch into the market with our TerraRover GPS Systems. LogicAll Solutions becomes official reseller of DataMetrics TuffRider Computers. LogicAll Solutions finishes development of Boom Monitor Software.